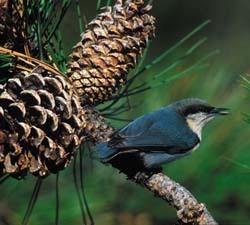 Three of the four North American species of nuthatches occur in Central Oregon. Nuthatches are small songbirds with long bills and short tails relative to their body size. They are often seen climbing head first down the trunks of trees, feeding on insects found on the bark. Because of their natural tendency to forage on trees, nuthatches are very fond of Bark Butter. They will also visit suet feeders, seed cylinders, and seed feeders filled with oil sunflower and shelled peanuts. 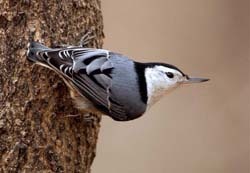 Nuthatches are cavity nesters, and will use nesting boxes for raising young in the spring and summer. During the winter, boxes are often used as sheltered roosting sites. Look for these three nuthatches species in your backyard habitat. The Pygmy Nuthatch is the smallest and most numerous nuthatch species found in our area. It has a blue-gray back with darker plumage on the head extending below the level of the eye. The feathers on the throat and breast are a dirty white color. 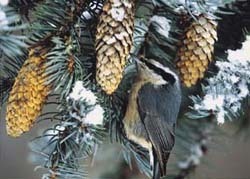 Of all the nuthatches, the Pygmy is the most social and is often found in small groups, even forming mixed species flocks with Chickadees during the winter. The Red-breasted Nuthatch has, as the name suggests, a reddish-orange breast. It is also unique among the nuthatches in having a dark eye stripe with white above and below. Red-breasted Nuthatches are intermediate in size between the Pygmy and the larger White-breasted species. Common in heavily forested areas, this species is often heard prior to being seen. They make a repetitive, nasal, tin trumpet sound. The White-breasted Nuthatch is our largest nuthatch. It has a white breast and a rusty vent. While the plumage is similar to that of the much smaller Pygmy Nuthatch, note that the white on the face of the White-breasted Nuthatch extends above the eye. The white feathers on the throat and breast are also brighter than the dirty white plumage of the Pygmy.